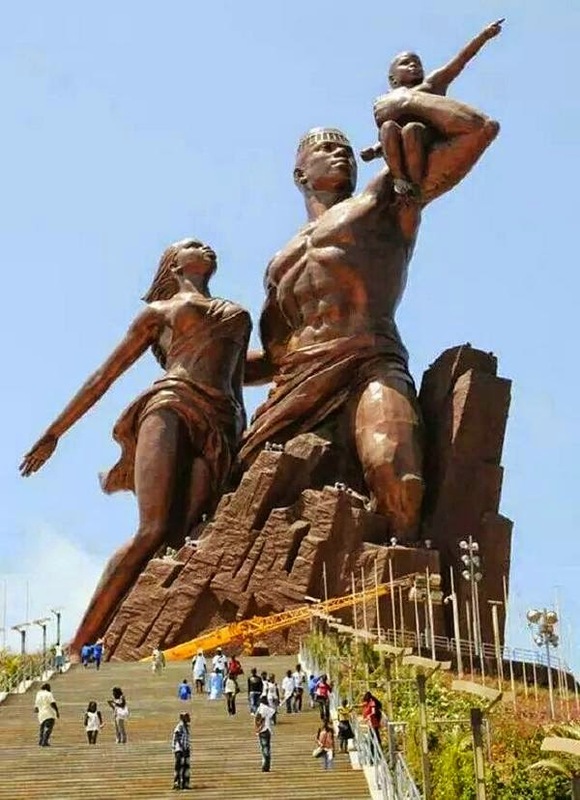 The African Renaissance Monument, Senegal, Africa. 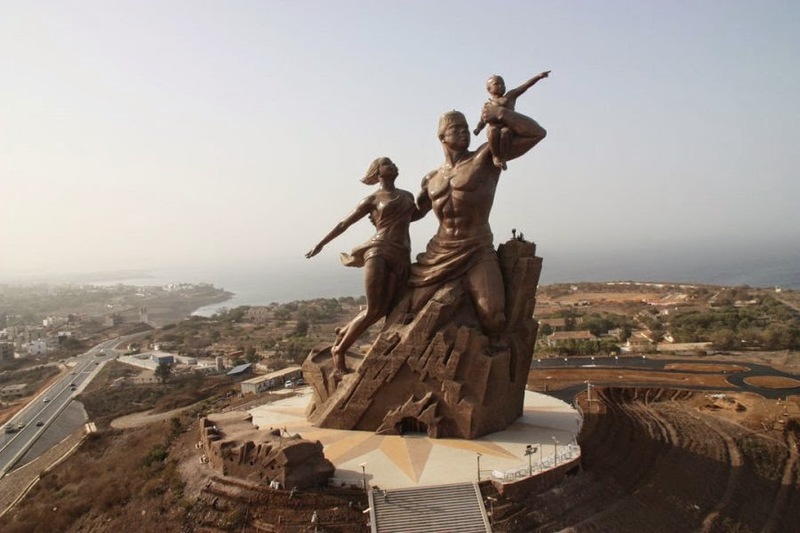 Monument De La Renaissance Africaine, is a bronze statue perched on a hill in Dakar, Senegal. The representation of a man, woman and child emerging from a volcano was inaugurated at a ceremony on April 3, 2010, featuring hundreds of drummers and dancers. The African Renaissance Monument stands erect against the West African skyline in Senegal at 164 feet high, taller than the Statue of Liberty in the U.S.A.
President Wade authorized the public works project in the capital of Dakar, described by some as an African Eiffel Tower and others as a work that should never have been commissioned. Its $27 million dollar (£17m) cost and style stirred complaints from many in the predominantly Muslim country. Ndeye Fatou Toure, a member of the Senegalese Parliament, said the statue was an “economic monster and a financial scandal in the context of the current crisis,” noting that half of Senegal's population lives below the poverty line. Additionally, the choice of garb for the African family was seen as an affront to the Muslim sensibility of public discretion. Ebrima Sillah, a Senegalese journalist, stated that many Senegalese fine artists took offense that Wade commissioned a crew of 50 North Koreans to construct the public sculpture. President Wade made a public statement that he chose the North Korean crew because they were known as experts in constructing large public monuments. Nineteen African heads of state attended the unveiling ceremony in Dakar. Notable public dignitaries included Bingu wa Mutharika, the Malawian and African Union president, as well as the African presidents of Benin, Cape Verde, Republic of Congo, Ivory Coast, Gambia, Liberia, Mali, Mauritania and Zimbabwe. 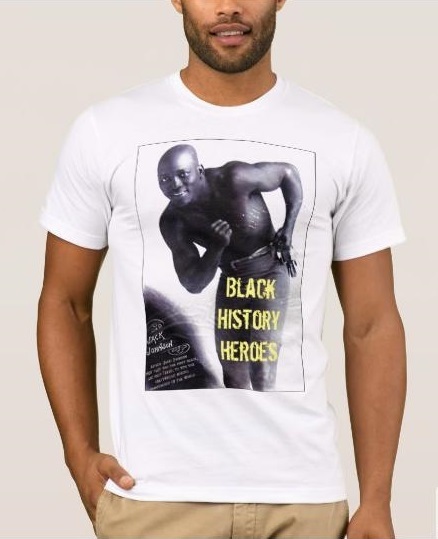 Additionally, a delegation of 100 African-Americans attended the ceremony, including Reverend Jesse Jackson and Senegalese-American singer Akon. After 40 years as president of Senegal, the 83 year old Wade announced that he will seek re-election in 2012. With close links to Washington D.C., the peanut and fish exporting former French colony has been cited for decades as an example of African democracy. In September 2009, Senegal was awarded a $540 million grant by the U.S. federal government to encourage its continued good governance. Exquisite! I think those who are offended should go back it their ancestral memory..pre-Islam pre Arab influence and look at through another set of eyes and filters. Sometimes things border on the ridiculous....that's why I disassociated myself with the teachings of the slave traders. I see your point and knoe how you feel, however, it is done now and cannot be changed. Sometimes, we have to accept what is and move forward in an united front because there are still many mountains still to climb. 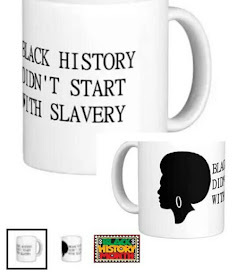 As an African American woman, it speaks volumes to me. It is rare to see us, as an African people, in such a grand monument. It is a symbol of who we really are, and what we are destined to be to the world once again. 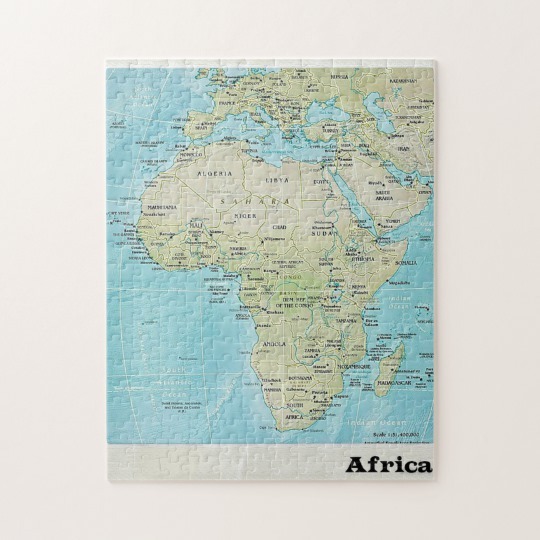 Wherever you are, let's stand united as One African people. dosent matter who made it!! !its is magnificent!!! Only things that matter,is What the monument represent! if you dont know about the story behind it,and just pass by,would you not stop!! !straight away!One of the best wonder i have seen,and only in picture!!! !i must travel to the place!!!!! sometimes expert come from different part of the world,i praise their work!! !or do you prefer a bunch of senegalese expert making the same statue in korea but representing koreean renessance??? ?its up to you. I don’t know who wrote this article but they have many things in it wrong. Just to put you into perspective, the President Wade who commissioned this statue ordered the French Army base in my country closed, well the new President Sall got them back in, it speak volume. FYI this statue was designed by Senegalese Architect Pierre Goudiaby who himself directed the project from A to Z.